Former Mormons who are now Christians say that this 21 minute video has been instrumental in helping them recognize the differences between the biblical view of salvation and the Mormon view of eternal life. It helped them understand what God has done to rescue them — to rescue all of us — from the consequences of our sin. Maybe the video will help you, too, to either come to know the biblical plan of salvation, or to help others realize and receive the gift of redemption God freely offers. You will find the diagrams and scripture lists referenced in the video below, but you may want to download a pdf copy for future use. 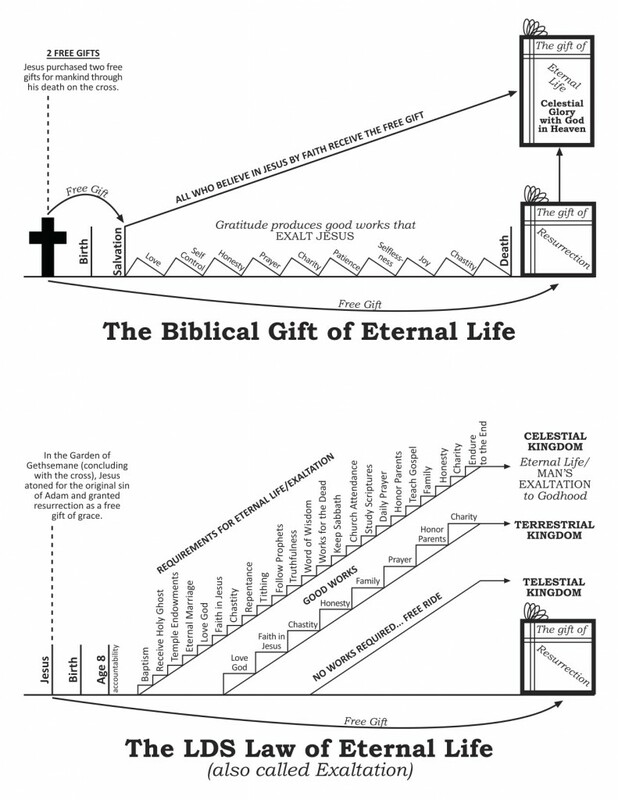 You will find the downloadable file “Eternal Life Diagram” at Tri-Grace Ministries. May God continue to use this presentation of His truth to draw people to Himself. 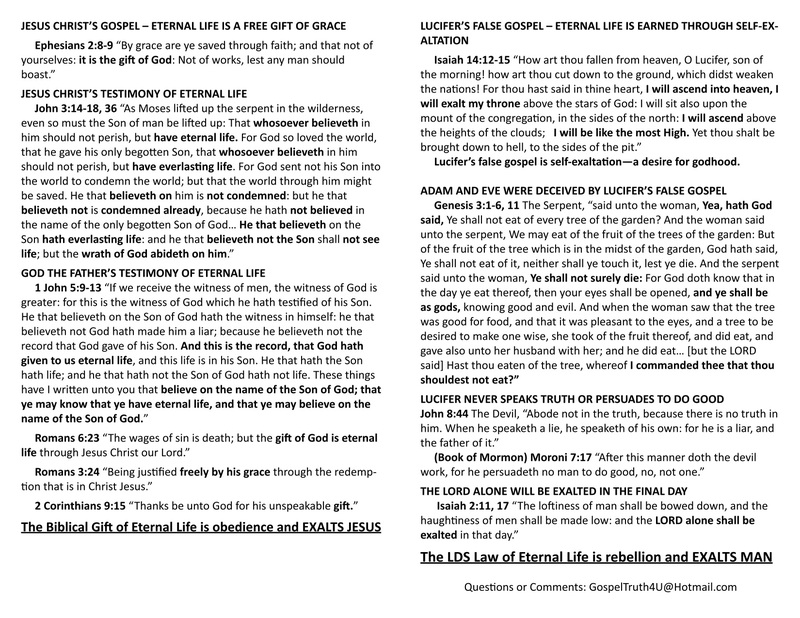 This entry was posted in Afterlife, Christianity, Friendship, Interaction, and Evangelism, Gospel, Grace, Salvation, The Fall and tagged Christianity, Church of Jesus Christ of Latter-day Saints, exaltation, Gospel, Mormon Church, Mormon Doctrine, Mormon Gospel, Mormon Salvation, Mormonism, Salvation. Bookmark the permalink. I watched the video and have also visited the website. These are serious people. They have their presentations down pat. I must admit, I sort of fly by the seat of my pants when given the opportunity to witness to Mormons. I think the Lord may have given me a conduit into the small population of LDS in our area. I even got invited to a baptism but had a previous commitment. The guy who was really good at this was Andy Watson. He had forgotten more about Mormonism than most Mormons know. I’ve lost contact with him but he use to relate some of his LDS encounters to me. Here’s something I’ve learned. It’s good to ask questions in order to find an area that can be explored with the LDS. It’s a marathon and I think most questioning LDS do it in secret and over a long period of time. It’s also noteworthy that Mormons believe a person’s entry into the Telestial Kingdom of heaven requires NEITHER WORKS NOR A BELIEF IN GOD: Atheists, Non-Christians and all manner of sinners are granted free entry. Although one might think it would relieve a lot of stress among Mormons to believe that they (and everyone else) will enter heaven, not so: Mormons are conditioned to aim much higher, to the Celestial Kingdom where near-perfection is a requirement. Maybe Utah’s excessive use of anti-depressants and high suicide rate are just a coincidence. However, Christians often note that flawed LDS doctrines can adversely affect a Mormon’s salvation. Could it be that the LDS doctrine of Salvation by Works is more a matter of life and death than previously thought? It’s always great to have another well articulated description of this fundamental truth . Because Mormon leaders have hijacked Biblical terms ( “salvation”; “eternal life” ; “born again ” etc ) and created their own definition of them , it’s important to be able to show the difference between them and what the Bible actually teaches . Early on when I was posting on MC I had this “ah-ha” moment. I realized, brilliantly, that the LDS posters had a totally different frame of reference than those of us who are Christians. It was an enlightening moment because the conversations felt like cross-cultural communication. So I began talking to them about how, according to their context within Mormonism, they were right. However from the perspective of Biblical Christianity, they were totally wrong. So it came down to a question of who had the truth? Funny thing. We can quote the Bible all day long and often times it has little impact because the LDS have been conditioned to believe that the Bible is corrupt and doesn’t contain the truth. They depend solely on what their “prophets” and other leaders have revealed to them. They are also hung-up on the concept of “authority” believing that their leadership has been given authority by God. This is a tough nut to crack. However for every Mormon, there will be a piece of information that will cause them to begin to ask a second or maybe even a third question. This is a case of going beyond the pat talking points supplied to them by the LDS church. Here’s the part I don’t get; it’s the “after all you can do” concept of grace in Mormonism. I’m painting with a rather large brush here by saying “Mormonism” because of the different flavors of the religion there are. It would be interesting to compare the suicide rates among other sects of Mormonism since there are those who don’t buy into the LDS/FLDS program. Andy Watson told me about some Mormon truck drivers he would run into on a regular basis who told him that they planned to do the work “in the next world”. So why doesn’t a Mormon just kick back and do the bare minimum knowing that Mormon grace will cover the short fall or that they have eternity to get with the program? We use to get Mormons who would show-up here contending that we believed that because we were saved by faith we could sin with impunity. Try as we may to explain what it means to be saved by faith they either couldn’t or weren’t willing to understand our explanations. I think part of it is that they had formed an idea of Biblical saving grace as part of their Mormon conditioning and they were not going to give it up. It would mean they’d have to change their thinking and when it comes to religion this is a bridge too far for a Mormon. You raise an excellent question: If Mormons can repent after death, why do it now? In spite of the fact that LDS leaders are often urging Mormons to repent now, it’s true that Mormons believe repentance and salvation can occur after death. When we die, according to Mormons, we go either to Spirit Prison or Paradise to await Judgment. But these are not places of rest with harps and halos. Or wings. Paradise is like a seminary combined with a university and a soup kitchen, where the righteous deceased continue repenting and learning about heaven and the universe, while at the same time serving those in Spirit Prison. Those not-so-righteous souls in Spirit Prison do pretty much the same, although they spend a lot more time repenting. A lot more. And learning, and helping others. And as you mentioned, it’s entirely feasible that some of them will repent and go on to the Celestial Kingdom after the Judgment. (2) the process of repentance will be much more arduous in the afterlife. Mormonism doesn’t have a lot of mysteries, but this was sure one of them. We never understood it. We didn’t put this one up on a shelf in the closet. We put it in a big box, carried it outside and buried it in the backyard next to the pet goldfish. So, Falcon, live long and prosper. The diagram above showing all the rules , laws, regulations, that is the Mormon gospel of salvation (eternal life ) , reminds of the infamous “gospel ladder ” Mormon leaders constructed and which LDS must climb up to receive complete forgiveness and reach God’s home in heaven . Mormon leaders have called their gospel a ladder as each rung on this ladder represents the works LDS must do to climb up to heaven . [ George Q Cannon , Gospel Truth , p 171 ] . It seems the last few years that some Mormons are attempting to sound little different from other Christians in how they describe how salvation ( eternal life ) is received . They’ll say things like “salvation cannot be earned by works , it is by God’s grace and faith in Christ etc . That’s a clever spin . It was recently used by Mormon Missionaries in brief conversation with a friend of my wife’s) . The Mormon gospel of salvation is truly ” another gospel ” ( Gal 1:8 ) , a good counterfeit that on the surface can fool people into thinking it is the real deal . There is ample information available from MRM to show that Mormon leaders have taught that receiving eternal life is earned by doing the many works these men have introduced as the “restored ” gospel . In Mormonism a person is only a “candidate” who must” qualify” for receiving eternal life , and they qualify by climbing all the way up Mormonism’s long ladder to heaven . Thus a person must do many things (works ) to receive complete forgiveness and a complete salvation ( eternal life ) . The New Testament presents no such gospel , and the first diagram above shows this fact . I see where Mormons are really hung-up on “authority” also. I’ve had at least one occasion here years ago where I was asked regarding my/our authority. The answer is pretty simple. My authority, if we want to call it that, comes from God. Having believed in Jesus for eternal life, I have been born again and am now the temple of the Holy Spirit; who resides in me. If any religious group has a claim on authority, it’s the Catholics. They can trace their lineage back to the early Church. I know Mormons try to pull this off with their priesthood but it’s a construction out of whole cloth. When Christ came He established His Church and proclaimed that the gates of hell would not prevail against it. On the Day of Pentecost, the Father sent the Holy Spirit to the Church. The Church consists of all born again believers in Jesus Christ. We do not need a religious system to assure our salvation. It is based on faith in Christ and Him crucified. In response to God’s call to eternal life, we live a mortal life in a manner which pleases Him. Our works are in gratitude for what He has done for us, not to claim a reward. Mormons can’t find their doctrine of salvation in the Bible. They are putting their faith and trust in men whom, they assume, have some sort of priesthood authority, apostleship and status as prophets. What they have is a concoction of Joseph Smith that is clearly not Biblical or Christian. If you’re interested in seeing the Mormon concept of gods and goddesses and the spirit world, this is the episode of Battlestar Galactica that has it all, including the people dressed in white (even the guns are white), the “Council of Twelve”, Gods — plural — vs. Satan, a celestial starship, and life after death. As I mentioned before, the producer, Glen Larson, was Mormon. The presentation is a bit hokey, but it’s the basic Mormon concept. I’d say to any LDS person, compare and contrast the two gospels and plans of salvation and then ask yourself, “What is the source of each?” If you can manage to let go of this idea that the gospel disappeared from the earth upon the death of the apostles and that the Bible is corrupt, you’ll find the way to eternal life. Jesus said, “I am the truth, the way and the life. No one gets to the Father accept through me.” What exactly did he mean by that. It’s not real complicated. I had a Mormon tell me once on here that the gospel message I was preaching was too simple. I told the Mormon that God didn’t make it complicated. But there’s this idea within the Mormon community that the eternal reward can be merited through hard work within the LDS system. All I can say is that this is not the gospel message as presented in God’s Word. Reading this than has removed any excuse anyone can offer about ignorance. Mormons rely solely on the truth of what they’ve been told by their leaders. One key to discussing grace with Mormons is to show them that their leaders have misled them time and time again, and that they should perhaps look at what the Bible actually says. historybuff brings up a good point , namely that LDS should look into the Bible for themselves to see what it really teaches about important doctrines — like God’s grace in relation to salvation . Mormon leaders have been unreliable as guides , and a examination of their gospel preaching track record ever since they arrived on the scene in 1830 attests to that fact . It reveals a pattern of unstable teachings . But sadly most Mormons don’t care about this , it seems that they have been conditioned to think that men who are dressed well , who act polite , who talk about being morally clean , just could’nt be the kind prophets Jesus warned would come in the latter days — Matt 24 :11 . But the bottom line is that Mormon leaders have long exhibited behavior that points to the fact that they just can’t get it right concerning their gospel preaching . By rendering the gospel of Jesus Christ into a system of rules it is no wonder why they can’t be trusted as guides in teaching the gospel of Jesus Christ . Jewish leaders in Jesus’ day succumbed to adding unnecessary rules about the Sabbath ( for example ) and thus diluted God’s truth ( Mk 7:7 ) Likewise Mormon leaders have acted in similar fashion with the gospel of Jesus , they’ve mixed in man made teachings to it thus rendering it “another gospel ” unable to save — Gal 1:8 ; 2Jn 7-9 . What’s interesting , and what every Mormon should hear , is that this is the same kind of behavior by certain men after the deaths of Jesus’ apostles which commenced the great apostasy — according to Mormon leaders ; i.e. altering the gospel of salvation which Jesus’ apostles preached ( Rom 1:16 ) by mixing teachings onto it that were not from God , thus corrupting it . So the gospel that Mormon leaders have preached is not the “restored ” gospel of Jesus , rather it should be called the ” revised ” gospel of Jesus Christ because Mormon leaders have substituted their own creation in place of the gospel Paul preached — Gal 1:8 . Let’s say for example that I told someone that God had spoken to me and said that all religious denominations’ creeds were corrupt and I was not to join any of them. Then let’s say that I claimed that God had revealed to me the real gospel. Don’t you think that some proof should be forthcoming to confirm what I claim? Telling people to pray for confirmation that would be a “burning in the bosom” is fools’ gold. It looks and sounds spiritual, but it’s just a typical religious con. Do LDS ever go beyond what they’ve been told and ask the second and third questions? I doubt it because if they did they wouldn’t be LDS. The reasoning of these folks is very flawed. Take for example the idea that the Bible is corrupt and doesn’t accurately reflect the Gospel message of Jesus Christ. The myth that the LDS have been told and accept is that the Bible was copied so many times that many pure and precious truths were left out. Is that true? Now whether or not the Bible is “true” is a matter of faith. Whether or not the Bible is accurate can be proven. The first verse of the Gospel according to John tells us that “In the beginning was the Word and the Word was with God and the Word was God.” There’s no record of Mormonism being any where in the first century Church. If someone is going to make their case for a different gospel from the one presented in the Bible, they are going to have to do more than claim the Bible is corrupt. They are also going to have to go beyond the LDS claims regarding the Council of Nicea and bring forth some actual proof. Finally LDS are going to have to explain why Joseph Smith started out with a pretty standard view of the nature of God and salvation and over time evolved into something else. Is it fear that keeps LDS from asking questions? I think it is. Fear is a manipulative technique that religious groups of a certain flavor use to keep people locked into their sect. They know that if people start asking questions and looking for answers the chances of their staying in the group diminishes greatly. So instill fear, get people to believe that the church leadership has the answers and introduce faux spiritual experiences and folks stay locked in. Mormonism can’t stand up to scrutiny. It survives on feelings masquerading as spiritual experiences and messages from God. The leadership of the LDS church knows that they have a crisis on their hands with members leaving. Yes fear does play a role . In autocratic religions like Mormons ( and Jw’s ) rank and file members are reminded that to criticize and doubt their prophet is akin to questioning God , thus it’s spiritually safer to be submissive and keep in step with whatever they teach / counsel . LDS have entered a system that keeps them very very busy , most just don’t take time to test their prophets properly . ( 1Jn 4:1 ) . They were won into the system largely by emotions and that is their plum line in measuring their leaders teachings . ” ….that those who criticize the leaders of the Church are showing signs of a spiritual sickness , which unless curbed , will bring about eventually spiritual death.” [ Harold B. Lee , Conference Report Oct 1947 p 67 ] . We pray that the Mormon people will dismiss their leaders as authorities over them and walk into the light of spiritual freedom that only the Lord Jesus Christ can provide to all those who bow before Him and ask for such freedom . I suppose if you really like the LDS church there would be no reason to question it. Just go along with it, assuming that it’s true and don’t rock the boat. It would take some measure of interest and curiosity to begin to study, reflect and process new information. Once a person knew the score, I wouldn’t think they’d be to excited about continuing on in the sect. So what if an LDS member does find the truth out about Mormonism, gets born again by the spirit of God as a result of faith in Jesus? I would say it would be pretty tough to go through the motions once you realize that the Mormon “Jesus” is not the Biblical Jesus. I’d be so dissatisfied once knowing and coming to the truth, in continuing in a false religious sect. If you were an active Mormon who discovered the truth, you’d be particularly dissatisfied when you realized that all your friends and family were blissfully spouting LDS untruths and you had to remain silent or be ostracized by everyone you know, family included. The LDS gospel and the gospel found in the Bible can’t both be right. The Mormon heavenly father and the Father revealed in the Bible are not the same, nor is the LDS Jesus or the LDS Holy Ghost the same as those found in the Bible. There are not three gods. There is One God. That’s a very difficult concept for a Mormon to phantom. The challenge for the early Christian believers was that since they were all Jews, and since Jews were monotheists, how to explain Jesus? That was the big battle. The Church Fathers constantly went back to the Scriptures in order to articulate the nature of God. What they found there was that there is One God. The way one of the Church Fathers explained the Son was to say that as the Word of God, Jesus was inside the Father. He was like the Wisdom of God or the Word of God. He was apart of God; inside God. He was in a sense, as a way of explanation, like a word we have within ourselves. When that word is brought forth, it takes substance or meaning. That was one view. But in that, Jesus was/is eternal as God is eternal. The Holy Spirit, then, proceeds from the Father and the Son. That’s the Godhead; One God but three separate distinct persons all of the same substance. I don’t know why I’m taking off on this except that sometimes that’s a real hang-up for Mormons. That was the battle in the first four hundred years of the Christian church. It’s all well documented. All of the sides can be heard. But from the very earliest writings, we see this message of who God is articulated both in Scripture and in other writings. Just know this. The Mormon concept as presented by the LDS church is not found anywhere in the writings of the Church Fathers, the Bible or even in the proceedings of the councils in the first four hundred years of the church. My point is, nothing was ever lost. It’s all well documented. There was no need for a restoration because the Word that was held to in the early Church is held to today. Mormons, of course, will counter that the reason none of their doctrines were expounded by early church fathers was that (1) by then the church was in apostasy, or (2) corrupt church fathers and translators deleted the truth for their own reasons. The trick is to get Mormons to focus on the fact that they can’t rely on their leaders for truth. Only then will they actually open the Bible. Yea I love these LDS conspiracy theories. Think about it. Mormonism was totally erased from the face of the earth before the prophet Joseph Smith came along and restored it. The way to prove that this Smith gospel was the real deal and true is to pray about it and get a feeling based on a book he penned. No other proof is needed. Not only that but after someone gets the feeling they have to accept everything the subsequent prophets proclaim. What a scam. Everything Mormon disappeared, pray about it and if you get a good feeling……….? Sounds super spiritual. Doesn’t matter that the restored gospel changed all the time and that other Mormon sects also claim the restored gospel which is different from what other sects say is the real deal.